Brad, JBB Findings, brass, 9x5mm with 5x5mm flower and 8x1.5mm post. Sold per pkg of 4. Brass brads have a nail-like head on one end, similar to rivets. The heads of these brads feature a flower design. Used in cold-connection techniques, brads offer an alternative to soldering; simply thread the brad through two flat components and flatten the brad's unfinished end with a riveting or ball peen hammer. Brad, JBB Findings, antiqued brass, 9x5mm with 5x5mm flower and 8x1.5mm post. Sold per pkg of 4. 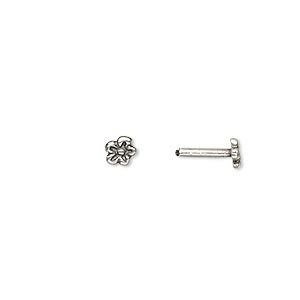 Brad, JBB Findings, antiqued silver-plated brass, 9x5mm with 5x5mm flower and 8x1.5mm post. Sold per pkg of 4. Brad, JBB Findings, brass, 9x6mm with 6x6mm sun face and 8x1.5mm post. Sold per pkg of 4. Brad, JBB Findings, antiqued brass, 9x6mm with 6x6mm sun face and 8x1.5mm post. Sold per pkg of 4. Brad, JBB Findings, brass, 9x4.5mm with 4.5x4.5mm seashell and 8x1.5mm post. Sold per pkg of 4. Brad, JBB Findings, antiqued silver-plated brass, 9x6mm with 6x6mm sun face and 8x1.5mm post. Sold per pkg of 4. Brad, JBB Findings, antiqued brass, 9x4.5mm with 4.5x4.5mm seashell and 8x1.5mm post. Sold per pkg of 4.